A research by NASA has found that 10 minutes bouncing on a trampoline is a more efficient cardiovascular workout than over 30 minutes of running. The report states that “for similar levels of heart rate and oxygen consumption, the magnitude of the bio mechanical stimuli is greater with jumping on a trampoline than with running.” The concept of Trampoline Fitness may still be at a nascent stage in India but it is certainly gaining momentum. 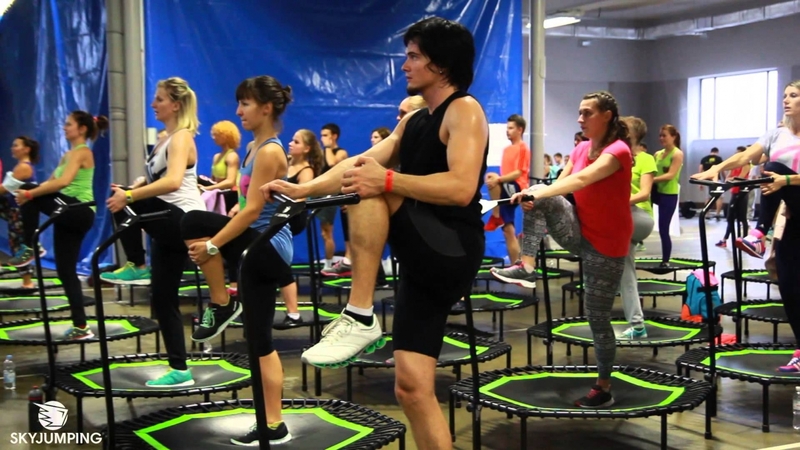 So what is Trampoline Fitness all about and how does it work? Well we demystify the concept for you right here, right now. The trampoline has been around for a long time and can be traced back to the history of China, Egypt and Persia. They were originally used to train astronauts and used as a training tool for many sports like acrobatics, tumbling, diving, gymnastics and freestyle skiing. Over the years this exercise has evolved to a level that it has become a sport that has made its place into the Olympics! Trampoline is an effective, low-impact form of exercise to keep oneself fit. Whether you work out on a large, backyard trampoline, jumping burns a significant number of calories. The intense workout for the cardiovascular system and muscles helps increase metabolic rate and all-over muscle tone. 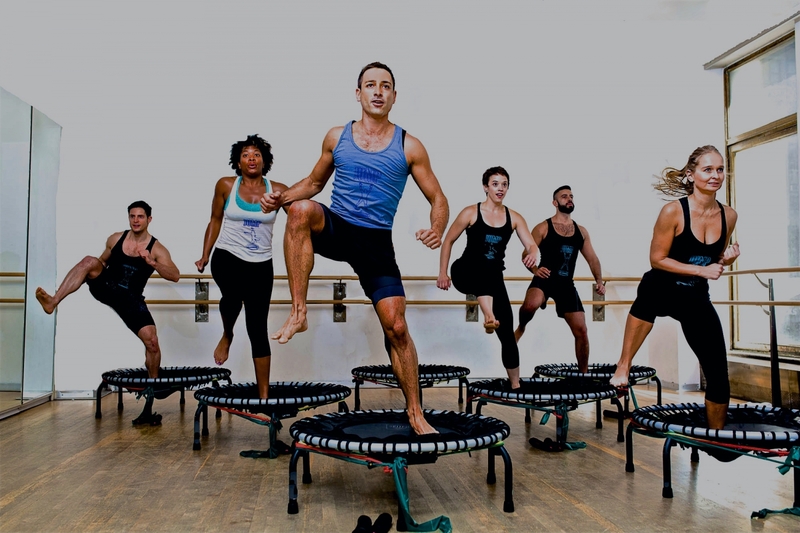 “Jumping on a trampoline, also referred to as a re-bounder, is an enjoyable low-impact workout that can provide you with numerous cardiovascular, health and fitness benefits. Exercising on a trampoline is a superior aerobic activity that can help you burn calories and bolster your metabolism, immune system and many other vital organs. A solid trampoline workout can effectively train the muscles in your abdominal, legs, thighs and buttocks. 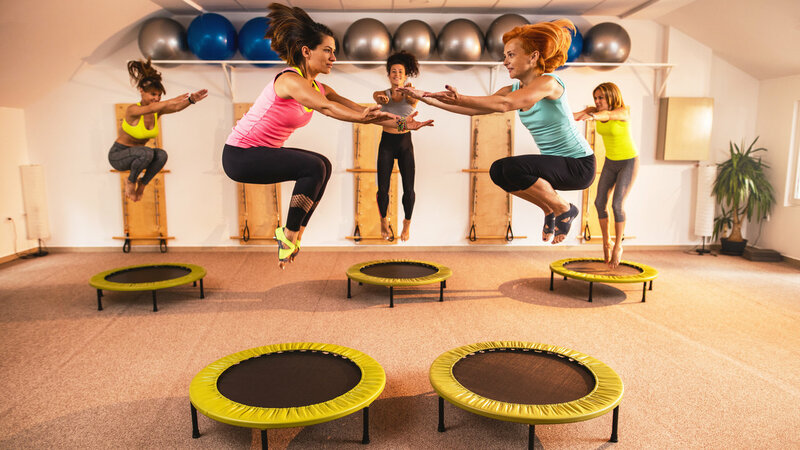 Rebounding can lead to increased lymph fluid circulation, which helps to increase the immune system by providing a greater white blood cell activity,” avers Prameet Kotak, Holistic Wellness Expert who offers trampoline fitness as part of his fitness programs. Jumping exercises have been known to be 68 percent more effective than running, compared to running you burn more calories while jumping for one hour on trampoline than you would running for an hour. 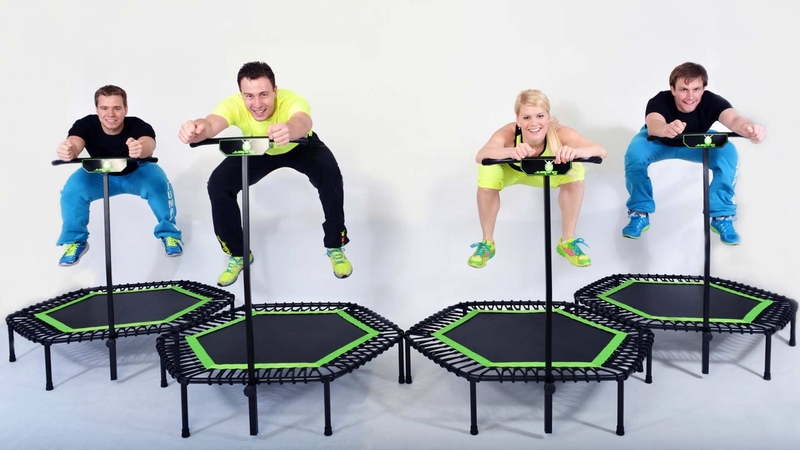 Trampoline aids to speed up your metabolism and reduce fat quickly. It is recommended to rebound for about 15 to 20 minutes on a moderate intensity level for at least 3 times per week for an effective weight loss. A whole-body exercise trampoline rebounding may result in a simultaneous opening and closing of the lymphatic valves thus increasing the flow by 15 times. Trampoline is more than twice as effective as running without the extra stress on the ankles and knees. It helps improve the effects of other exercise you do. “One study found that those who rebounded for 30 seconds between weight lifting sets saw 25% more improvement after 12 weeks than those who did not. If you have special medical conditions like slip disk and hip problem. One should take care of standing position and jumping range,” advices Tej Mlak, Fitness Trainer, Anytime Fitness. Being an antigravity cardio training, it is low-impact and easier on joints. “Trampoline is made with a piece of taut, strong fabric stretched over a steel frame using many coiled springs. People bounce on trampolines for fun, fitness and competitive purposes. Trampoline maximum weight capacity range is from 70-180 Kg, depending on the size. Jumping on a trampoline burns approx. 7 calories/minute which proves that it is a good option for cardio workout,” adds Mumbai based Abhishek Thakur, Certified Fitness Coach, Obino, a health and weight loss app. Incidentally Obino does offer trampoline fitness as a way to stay healthy as well. Obino lays stress on a human to human coaching model which is learning-based and is high-touch – where users communicate with their coaches on an average of six to nine times a day, both online or offline available for users in the premium version of the app. So how does it benefit the user? 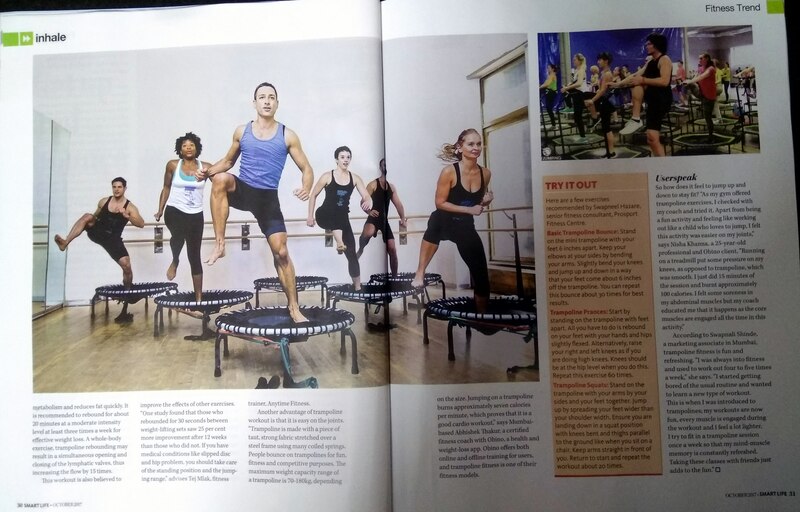 Nisha Khanna, 25, working professional and Obino client explains, “as my gym offered trampoline exercises I checked with my coach and tried it. Apart from being a fun activity and feeling like working out like a child who loves to jump, I felt this activity was easier on my joints. Running on a treadmill put some pressure on my knees, as opposed to trampoline which was smooth. I just did 15 minutes of session and burnt approx. 100 calories. I felt some soreness on my abdominal muscles to which my coach educated me that it happens as the core muscles are engaged all the time in this active.” Swapnali Shinde, 30, Marketing Associate, Mumbai adds, “I was always into fitness and used to work out 4-5 times a week. I started getting bored of the usual routine and wanted to learn a new type of workout. This is when I was introduced to trampolines; my workouts are now fun, every muscle is engaged during the workouts and I feel a lot lighter. I try to fit in a trampoline session once a week so that my mind-muscle memory is constantly refreshed. Taking these classes with friends just adds to the fun.” So, get ready to jump and move towards staying fit the fun way. 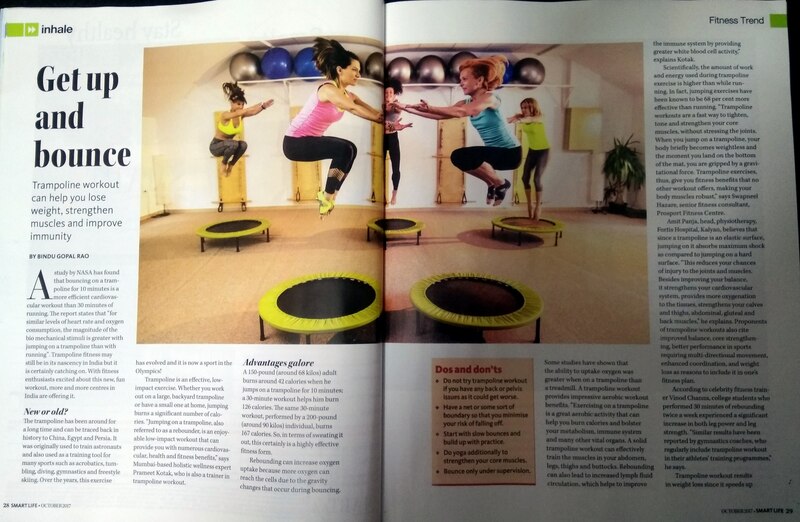 Athletic women exercising in health club and jumping high up on mini trampolines. 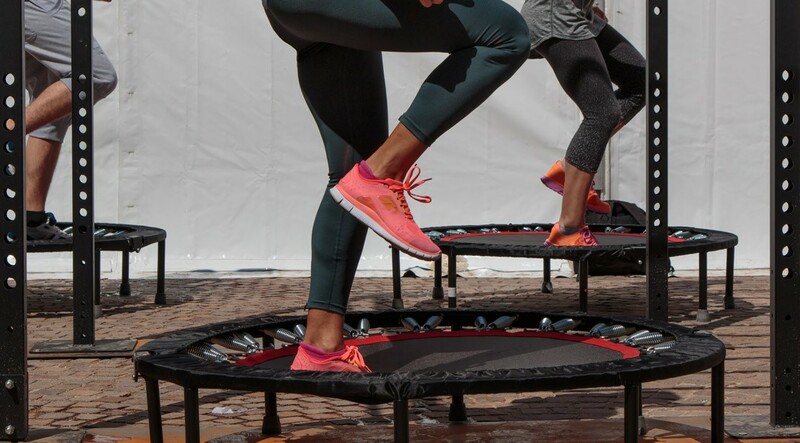 Basic Trampoline Bounce: Stand on the mini trampoline with your feet being apart at 6 inches. Keep your elbows at your side by bending your arms. Slightly bend your knees and jump up and down in a way that your feet come about 6 inches off the trampoline. You can repeat this bounce for about 30 times for best results. Trampoline Prances: Start by standing on the trampoline with your feet apart. All you have to do is rebound on your feet with your hands and hips being slightly flexed. Alternatively, raise your right and left knee as if you doing high knees. Knees should be in the line hip level when you do this. Repeat this exercise 60 times. Trampoline Squats: Stand in your trampoline with your arms being placed at your side and your feet together. Jump up by spreading your feet wider than your shoulder width. Ensure you are landing down in a squat position with bent knees and thighs being parallel to the ground like when you sit on a chair. Arms need to be straight in front of you. Recoil back to the position you started with and repeat the workout for about 20 times. Make sure you do not have any back or pelvis issues as it could get worse. Have a net or some sort of boundary so that you minimise your risk of falling or bouncing off. Start with slow bounces and build up with practice. Do yoga additionally to strengthen your core muscles. Do not bounce without supervision. After jumping on a trampoline for 10 minutes, a 150-pound adult burns around 42 calories. A 30 minute workout burns 126 calories. The same 30 minute workout performed by a 200-pound individual, burns 167 calories.